How to Ride a Scooter - Scooter Driving Tips - Obey Scooter Laws! When I first started thinking about buying a scooter, I know one of the things I was unsure about was how hard it would be to ride a motor scooter. How hard would it be to balance? Would leaning into a turn scare me? Would cars and big SUVs see me? I was definitely in search of a few good scooter driving tips! Fortunately, my husband had been driving a motorcycle for many years. So he was able to give me a lot of pointers and tips that really helped me out. And even though motorcycle driving is different in some ways than riding a scooter, in other ways it's pretty similar. But what if you want to know how to ride a scooter and you don't have anyone you know who can teach you? Does that mean you shouldn't buy one? It's not hard to learn to drive a scooter and help IS available. If you're just getting started, here are a few scooter driving tips that may help you learn how to ride a scooter safely. Be prepared by wearing protective gear. You need to wear eye protection, a helmet, tough, highly visible clothing, and the right footwear. Rain gear doesn't hurt either. Understand your legal responsibilities. Know what your local scooter laws are before you go out on the road. Know your scooter & master basic skills. Once you've bought your scooter, learn all you can about it and its controls and working parts. Take time to learn skills such as braking, accelerating, cornering and curves, so that when you go out into traffic, you're prepared. Next, master advanced skills in real-life traffic situations. 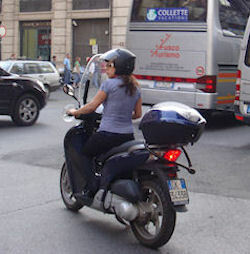 The next step is to learn how to handle your scooter on busy streets, on the highway, at night and in heavy traffic. Step by step, you gain confidence and skill. Learn how to handle special situations. Learn emergency procedures, such as how to brake suddenly to avoid a collision or an obstacle. Other skills include braking while on a curve, coping with skids, riding on uneven surfaces, and handling bad weather/road conditions. Move on up to group riding and carrying passengers. One of the wonderful things about scootering is its natural affinity for social gatherings. Riding in a group can be fun, yes, but it is a new skill you need to master if you're going to do it safely. You can learn more about each of these scooter driving tips areas by downloading the MSF booklet, You & Your Scooter. For myself, just mastering each level of skill as I learned how to drive a scooter was the key. I started riding up & down the street in my very unbusy neighborhood, moved on to a parking lot and then started venturing further and further from home on busier and busier roads as I gained confidence and my ability to handle my scooter. It worked for me... and it will for you too! I guess the motor vehicle authorities realized how important it is for motorcycle and scooter riders to know what they're doing out there on the road, because most states offer some sort of official training skills course. In Idaho where I live, it's called STAR, which stands for Skills Training Advantage for Riders. But in many other states, the Motorcycle Safety Foundation (MSF) runs a course called Rider Education and Training System (RETS). 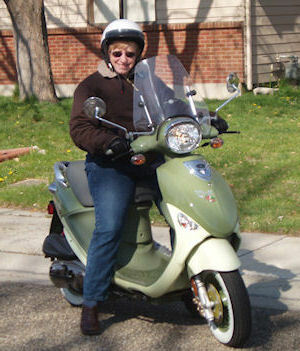 You can learn more about these courses on my scooter driving classes page. So... you're probably wondering why do I keep talking about motorcycle training courses on a scooter site, right? Well, here's the thing... the skills are quite similar and so it's perfectly OK to take a motorcycle skills course, if that's all that's available in your area. However, you may be able to find a dedicated skills course on how to ride a scooter these days. In closing, the best place to get reliable scooter driving tips that truly help you learn how to ride a scooter the right way and understand scooter laws, is to take a skills class. Click here to get some scooter safety tips. And if you have any questions at all about how to ride a scooter, just ask!